My name is Therese i am 48yrs and active my last lessons were Piloxing and swimming. I read quite a bit about Pilates so I decided to join. I started Pilates 4 months ago,the first 2 months once a week and twice a week these last months, however, I am feeling pain not muscle pain which I do get but I am used to that it's like my joints hurt all over, something I never had before or after any class so I am worried that maybe Pilates is not good for me. I hope I am wrong because I really enjoy myself. Hi Therese and thank you for writing. That is concerning that you are experiencing joint pain. Just a couple of questions for you to consider before stopping your Pilates practice. Are you on a hard floor and your mat is not thick enough to support your body weight? Are you well versed in the fundamentals of Pilates prior to moving forward into a more advanced level of class? Talk with the instructor and share your concerns. Review my Pilates ebook here for the fundamentals, as well as several of the videos and free pages of exercise descriptions to make sure you are doing the exercises properly. 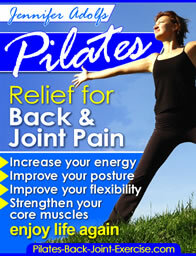 I hope you come up with a solution, as I really believe Pilates can be tailored for everyone.